Flipping Death is from the same developer, Zoink Games, that made Fe and Stick it to The Man! I loved Stick it to The Man! so much that I had to try this one which used same kind of concept. Stick it to The Man! was hilarious and weird and it didn’t seemed to have overly complex gameplay, so I trusted that Flipping Death would be the same. My first impression was positive as how much it was voice acted for being ‘kinda’ small game and how it had a unique gameplay system. Flipping Death tells story of a young woman, Penny, who got killed in an accident and then enters to the realm of the dead (which is the ‘flipping side’ of the gameworld). Then she got a job from the grim reaper (Death) who wants to go on vacation for a while, so she takes his place. Penny finds out that she can possess humans from the flipping side and use their body to do different kinds of things and also listen their thoughts. She also helps dead souls to catch their killers and do other requests they ask, but foremost she wants to know what happened to her — and why is someone else possessing her body in the living world? 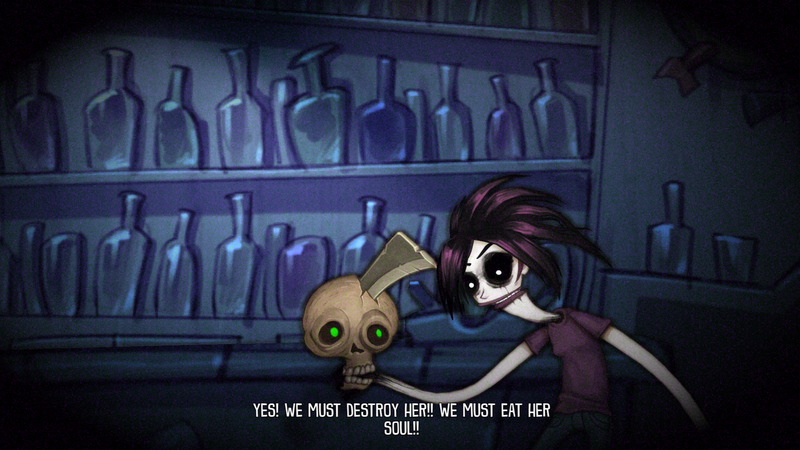 The gameplay consists of collecting different things in the dead world so you could possess living one. Every person (or animal) had certain amount of ‘ghosts’ needed to collect and some even needed extra special ones. The living world was full of puzzles that had to be solved to move forward in the story, but it also had many side quests. Controls were little bit weird. Penny could use her scythe to teleport but the scythe had to be thrown first to that specific spot. It felt awkward maybe half of the game and especially when it needed to be done fast. Every living person had one move or ‘purpose’ (such as licking, biting, be a doctor, police or tennisplayer…) they were able to do which meant that every person was part of the puzzle and all I needed to do was memorizing their role and how they could possibly to be used. Using these powers was explained after possessing the person but still it was bit awkward to move Penny or the living ones. Flipping Death is bold and colourful. This game looks nice but after playing some 4K supersharp detailed game this felt like some little kids game. I liked art style, which was pretty same as in Stick it to The Man!, seemed almost like 2D made from flat cardboard boxes with different layers on top of each other. Voice acting was good even though it became annoying to listen the same lines the characters said. This happened when I didn’t know how to proceed in the game and had to try everything and everyone over again. Background music was nice, quiet and easy which suited to this type of game. I don’t think Flipping Death was supposed to be difficult to play but the difficultiness lies in the puzzles and with a bit awkward controls. Difficult was to try to use ‘real world’ logic in this quirky game and trying to find use of each character because every living person could be possessed and some of them were used only to do the side missions. I found the story to be interesting and it had twists and turns here and there that kept me going. If you’re looking some 18+ humour this is not it, it was more of bizarre and funny in basic comedic level. I was sometimes frustrated because the gameplay was relatively slow and trying each character to each puzzles and places and moving them across the gameplay area was slow and painful process. Especially when I had no idea what to do and finally tried the same thing at least three different times when finally it worked. I could teleport to other places by using the map, but only to spots that had souls or humans which needed to be possessed first to use this action. Teleporting in living world was not possible and humans didn’t stay where I left them; after not using them they returned back to the original spot. I was not happy. I like Flipping Death, but I don’t think I will ever play it again due to the slow gameplay system. But I will rise my scythe for appreciating the unique style they have come up with. For this being 19.99€ it felt five bucks too much. I have noticed how video game prices have skyrocketed to the gods; they’re usually some 69.99€ AAA—studio video game that comes out half done. If I compare to that, this is cheap by all means with better overall quality and finishing.